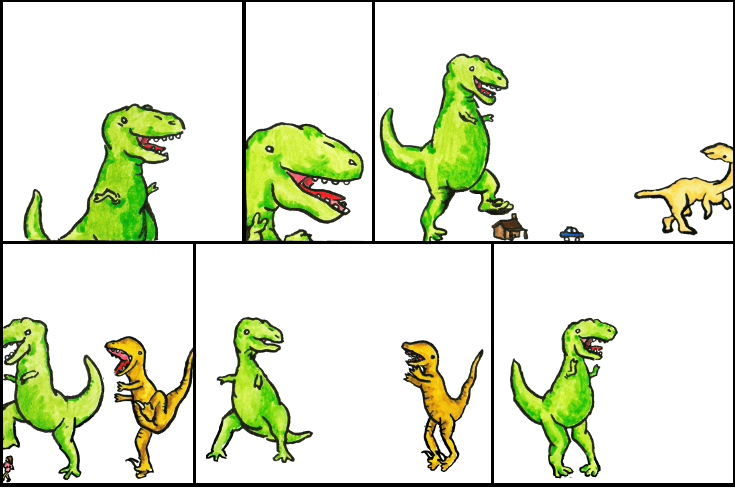 Dinosaur Comics - April 12th, 2010 - awesome fun times! –ZING ON SENIORS, AM I RIGHT?? April 12th, 2010: The MoCCA comics festival was a lot of fun! The building was not super overheated this year and I met both my cartoonist friends AND a bunch of awesome people who came up and told me they like Dinosaur Comics, which is awesome, because I'M the guy who makes them! I drew a T-Rex on an iPad (just - just not very well) and Emily showed me this awesome cross-stitch she'd made. And when I posted the cross-stitch on my Twitter, Andrew sent me on he'd made too! I was sitting near Andrew Hussie of MS Paint Adventures and at one point he passed me a note which I was really excited to read but then I opened it and found this (or - or this). Luckily Andrew Hussie of MS Paint Adventures was not armed with a camera so the notes I passed him in exchange will forever remain a mystery to all except him, as they are no doubt seared upon the very grey matter of his brain.